We’ve decided to start hiking a bit earlier than we originally planned, for a few reasons. The early start will allow us to walk fewer miles in the beginning of the trip and more gradually increase our pace. It has been a very low snow year for California, so starting a week early shouldn’t cause any snow challenges. Also, we finished our tour of possible new cities (more thoughts on that below). Finally, as you might guess, we’re antsy to hit the trail. Our new plan is to start hiking north from the US/Mexican border on April 19th. That’s less than a week from now! We had a great tour of potential cities to live in after we finish the hike. Each place had its own unique feel and culture, and we’re glad we took the time to explore them firsthand. 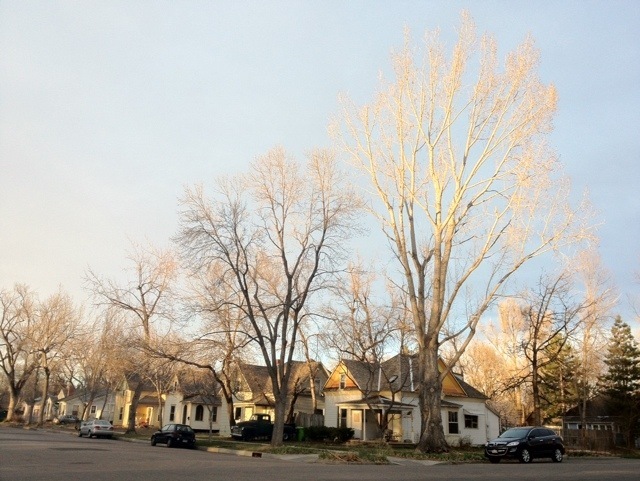 The place that clicked with us best was Fort Collins, Colorado. The friendly, down to earth people, good bike lanes, lively walkable downtown, proximity to the mountains, and art scene were all major positives for us. We are very excited to call Fort Collins our new home after hiking the PCT! Although we just picked a new home city, the woods and mountains of the Pacific Crest Trail will be our home for the next five months. 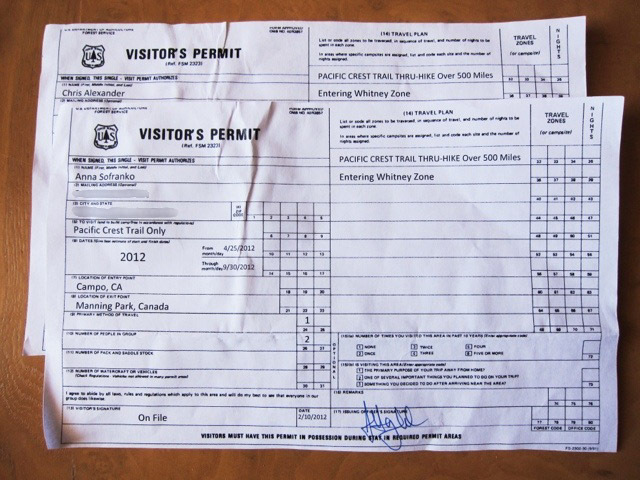 We received our permits from the Pacific Crest Trail Association (PCTA) allowing us to camp anywhere along the trail. We are very grateful to the PCTA for coordinating with the many National Park, State Park, and Forest Service organizations to make this permit process so simple. One permit for 2650 miles! Best wishes on your hike! Hey Keith, I just checked out Ellen’s Daily Mile page and she is one active gal! It’s cool that we’ve actually done some of the same (or similar) races – the Wildflower Tri and the Oyster Urban Adventure race. I’ll send her a note when we land in Fort Collins. Maybe we’ll go on a run, although she might dust me! Thanks for introducing us. Woohoo! April 19th! Enjoy your time out there:) Happy trails! Thanks Kit! In deciding when to start we thought about how you and Jacob skipped the ADZPCTKO last year. The relaxed beginning should be nice. Haha, well we aren’t moving to Longmont so you can stay put. Will be fun exploring the Colorado peaks with you guys! Congratulations on picking a new home base. May you enjoy a smooth start to your journey on the 19th. Whoa, that’s crazy! We’ve been in Flagstaff for the last few days so I think we were in the same city and didn’t realize it. Enjoy New Mexico. We recommend ordering Christams (red and green chili) cheese enchiladas. Yum. Hope you have a wonderful trip and move! Looking forward to following your trek from Cincinnati. Good luck. Thanks Bob! It’s great having so much Cincinnati support! Awesome news on both fronts! Ft Collins sounds like a perfect choice, and I can’t wait to start reading posts from the PCT. Thanks Dad, it’s exciting that you’re following along, and we can’t wait to get started. You should come visit Fort Collins and we can go for a hike in Rocky Mountain National Park! Awesome! We will definitely come visit you in Fort Collins. Can’t wait to read about the trip. We’ll be excited to host you! It’s a pretty cool town, and Rocky Mountain National Park is very close too. Woohoo! Walk Anna and Chris, Walk! If possible, I’d love to join you briefly in May. It’d be fun to have you join us for a section in Southern California. In a day or so, we hope to send out an email to friends who want to meet us on the trail, so keep an eye out. Good luck with baby prep! Hugs to you and Wendy. Thanks Joe and Elaine! Your kids are going to want to go hiking this summer after seeing all our pictures. :-) Glad to have you following along. Here in the midwest it’s a no-fire zone. Fallen trees & too little snow over the winter. You have better conditions? Where can I get a PCT map like G’s & J’s? So, less than 100 hrs. to go, right? I’d say that’s countdown time! The Best of Trips to you!!! It’s been pretty dry in California too. We hope there won’t be too many fire closures on the trail. You can get the map at http://shop.pcta.org/trail-maps/ . You want the Pacific Crest Trail Map / Brochure, and you can choose either the folded or unfolded version. Thanks for the well wishes, we are very close now! Anna and chris – bonne voyage from the cubes at EPA (and the bay area hills and hollows). How exciting that you are starting the walk early AND that you already know where home is. Looking forward to hearing more as you walk. Seeing the names of the towns you will go through really brings home what a wonderful trip you will be on all the way to stehekan! Thanks Suzanne. We really enjoy the names of the towns and landmarks too. Some of my favorite names are Three Fingered Jack, Skykomish, and Idyllwild. Let me know if you need pictures of certain waterways. I’m happy to provide a snapshot of their condition or their surrounding vegetation. I mean…to Canada! 3 Cheers! Not surprised you picked Fort Collins…the Front Range is fantastic. You’ll love it there. Hope you have an awesome PCT hike. Thanks, jakestay! Let us know if you have any favorite Front Range hikes. There are so many options!